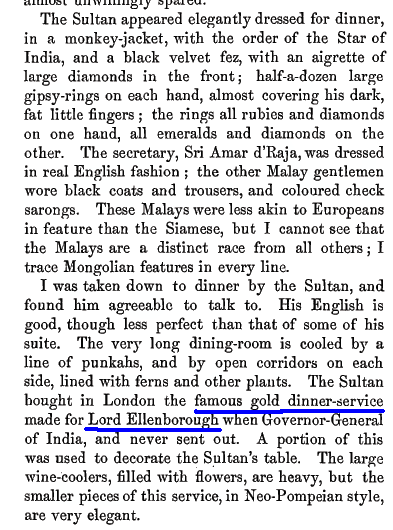 "Lost" as it were not made known to public, that HRH Sultan Abu Bakar owned the infamous Golden Dining Set of Lord Allenborough, the Conquerer of Sind and Afghan. 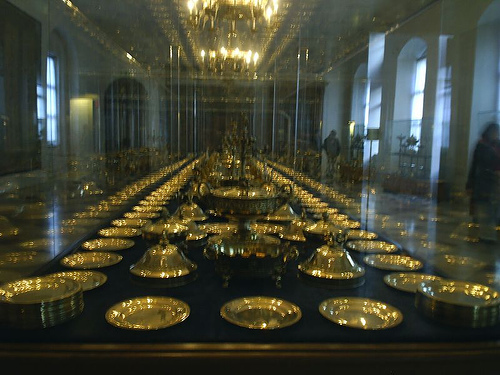 The kollection of solid gold plates, cutleries, bowls and cups were fit for 50 attendee of long table in royal banquet. 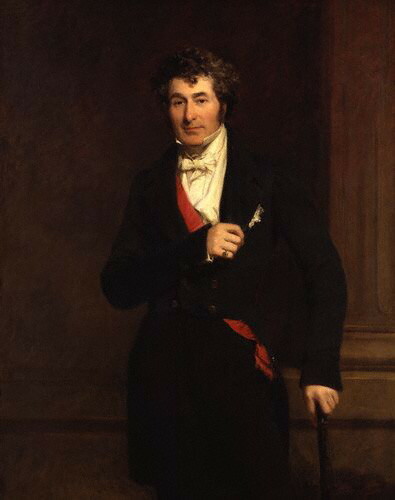 Lord Allenborough served the Governor General of India from 1842 to 1844. He occupied his tenure in the India's office with wars and iron fists. The legend speaks that this 'gold' were made from war booty confiscated from personal kollection of dozen kings and queens from palaces of Emirs and Kings of Sind, Ghazni, Jalalabad, Gwalior and Sultan of Afghan in Kabul. This kollection of golds later melted, and casted to make GOLD DINING SETS of Lord Allenborough as he himself has sworn to drink and eat from the skulls of Sultans and Kings of India. Acquired by HRH Abu Bakar in 1865 from the unknown auctioner in London. Now kept in the impregnable black steel safety in Istana Besar. Last seen in 1959 during the Diamond Jubilee of HRH "The Brassball" Ibrahim. Unknown to us, Istana Besar treasured the golds from the ancient Sultans of India and Afghan.